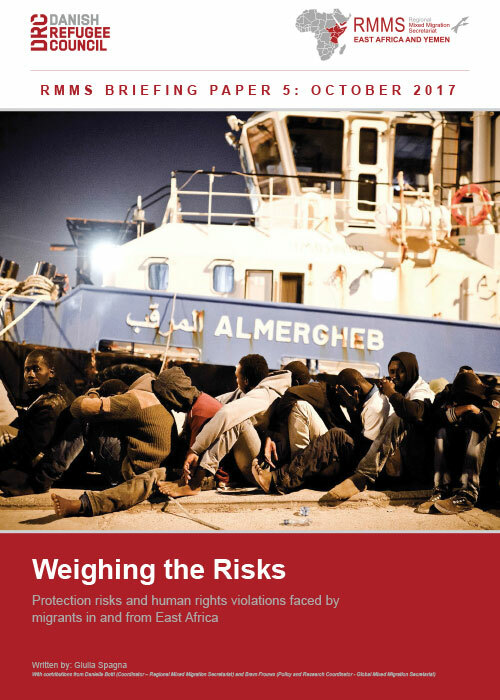 This paper builds on nearly 4,000 interviews with migrants and smugglers to present an analysis of the protection incidents occurring along the four main migratory routes within and from the Horn of Africa (North-west towards Libya and Europe, East towards Yemen and the Gulf, Northern towards Egypt and Europe, and South towards South Africa). Quantitative surveys and qualitative statements collected from September 2014 to March 2017 through the Mixed Migration Monitoring Mechanism Initiative (4Mi) depict an in-depth overview of the multiple human rights violations facing migrants on their journey. Divided into thematic sub-chapters, the paper outlines statistics and hotspots for the main incidents investigated. Quotes from migrants and smugglers are included to detail individual experiences and perspectives. Findings complement the existing literature on migrant’s smuggling and abuse in the Horn of Africa and allow for a closer look at new trends in this field.